Respecting the limitations of the earth is a precondition for human well-being. SYKE and Sitra have prepared recommendations for accelerating sustainable well-being in Finland. Like many other countries, Finland is committed to promoting sustainable development in accordance with the goals set for all countries by the UN’s Agenda 2030. However, according to research, we cannot reach these objectives because of our significant ecological sustainability gap. A change can only be accomplished by policies that reduce the consumption of natural resources, safeguard diversity and raise emissions targets. SYKE and Sitra have compiled recommendations for accelerating sustainable well-being in Finland in co-operation with researchers from Stockholm University and the University of Jyväskylä. Respecting the limitations of the earth is a precondition for human well-being. Finland has a great opportunity to become an internationally active leader in building paths towards sustainable well-being, in the same way it has led the way in its peacekeeping roles. The state, local authorities and companies play a key role in changing the political landscape. All economic functions should be based on the circular economy. However, the most important thing is to significantly reduce unnecessary materialistic consumption, which consumers can also affect with their choices. Based on many well-being indicators, Finland is doing excellently. Long life expectancy, high levels of education and satisfaction with life have been accomplished as a result of comprehensive social policy and economic growth. However, the success story has come at a price: it endangers the natural system maintaining good human lives while placing stress on the foundations of well-being and the economy. We have outsourced our environmental impacts. “The Finnish levels of consumption and manufacturing are not sustainable. Consumption in Finland has exceeded a globally fair and sustainable level, which has also happened in other countries in the European Union. Our consumption goes beyond all limits of ecological sustainability, with the exception of fresh water use,” says Eeva Furman, the director of the Environment Policy Centre of SYKE. 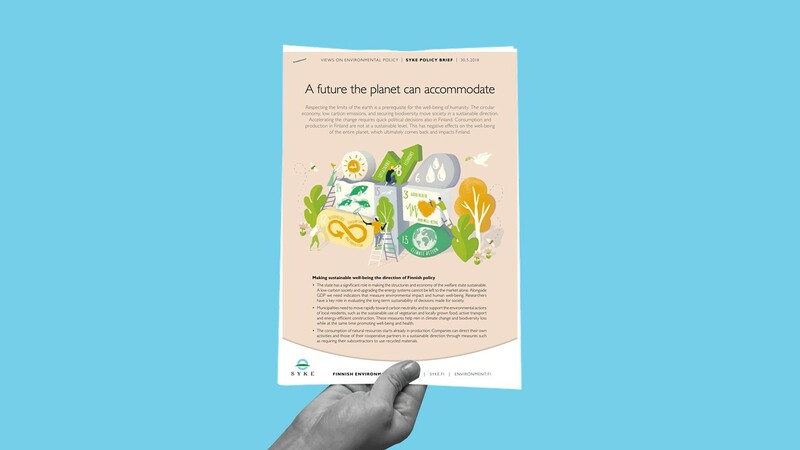 For more information, see the joint press release from SYKE and Sitra (link in Finnish), listen to a podcast discussion on the future of the earth (link in Finnish) by Eeva Furman and Mari Pantsar and read the policy brief “A future the planet can accommodate”.